… to Traigh. 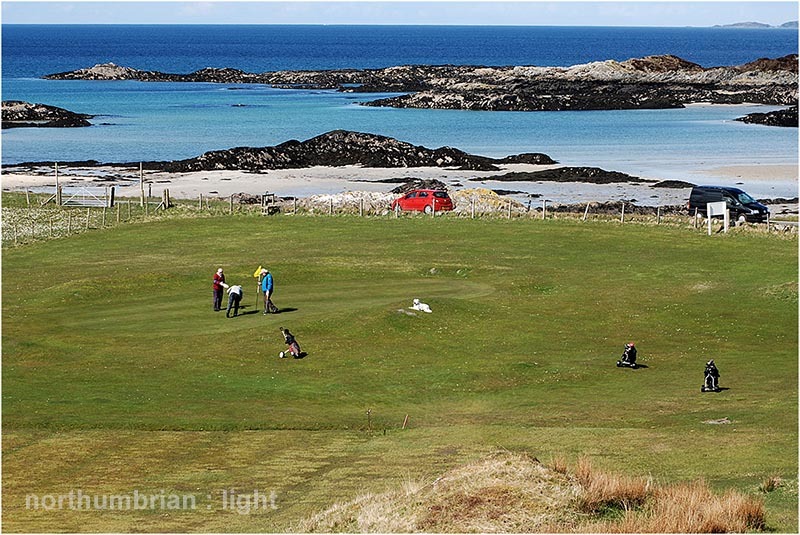 The yearly pilgrimage to Arisaig is nearly upon us – the Traigh Open, 28th July 2018. One of the most spectacular golf courses in the UK – the absolute epitome of Golf in the Wild. Golf in the Wild has led to some interesting connections both on and off the course. Yesterday (6th December) I spent an enjoyable round at Allendale in the company of the good men of Traigh who loved the wilds of Allendale golf course as much as I love the wilds of Traigh. It reminded me of one glorious Spring day spent researching the book at Traigh when at the ninth I caught up with this happy scene – three men and a dog putting out to finish their round. My first holiday romance was at a farmhouse near St David’s in south Wales. I fell for the farmer’s daughter, she was about sixteen and I was barely four. I can still feel her soft hands on my shoulders. She was the first of the gender to make me realise that girls could be loving creatures, unlike my sister, too engrossed in her own older world and my mother, too much in charge. The night the holiday ended, back home, I was distraught, crying a river into Robin-starched sheets. Ever since I have had an overly-moist sentimental streak for people and places left behind. Traigh is such a place.